How do I make a payment with Visa Checkout? 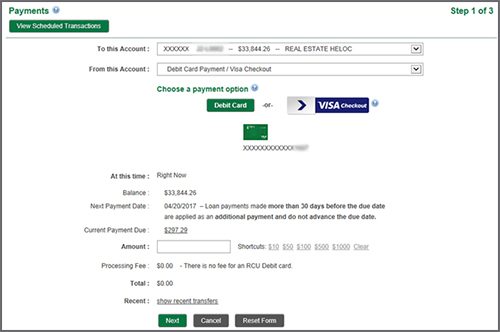 To make a payment select Transfers & Payments and choose Payments from the menu in online banking. You will be prompted to enter your Visa Checkout user name and password. Click "Sign in to Visa Checkout". If you do not have a Visa checkout account you can create one. Your digital wallet will appear and you can select the card you wish to use and click “Continue”. 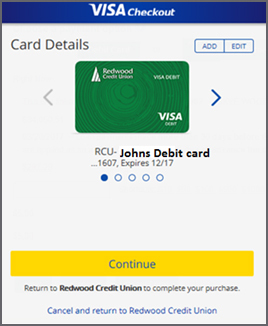 This will populate the card information into RCU’s payment page. Fill out payment information and click “Next”. 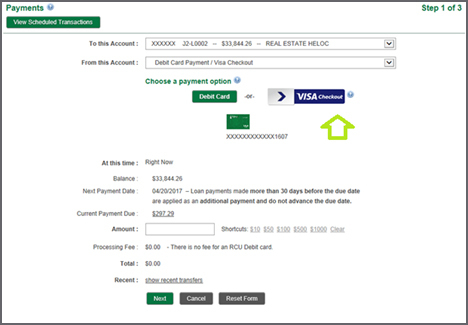 The card image will be displayed and references the last 4 digits of the card number. Review the information and click “Confirm Payment” to process the payment. The payment is complete and you can print the receipt. 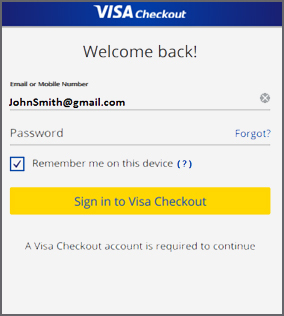 How do I create a Visa checkout account?